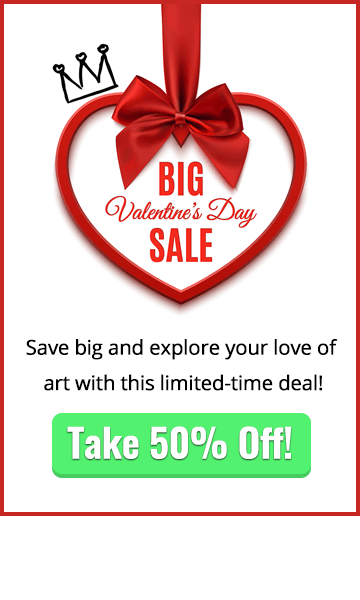 Ready to learn more about how to paint a pin up girl in Photoshop? It’s time to start adding in more of the finer details to this coloring job. Start off by adding a little shadow between the hair and the skin with a darker skin tone. Then add a little highlight to the tip of the nose. Use a slightly yellow tinted color for adding additional highlights to pick up on the yellow light that would naturally be coming from overhead. The apply the same highlight treatment to the forehead and the cheeks to bring up their color and lighten it up even more. 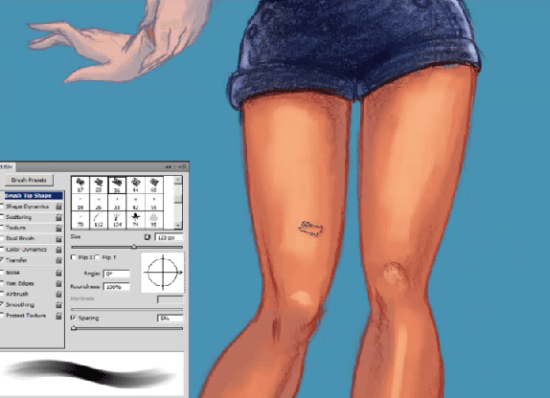 Now, for the next part of this tutorial on how to paint a pin up girl in Photoshop, let’s improve the rendering on the leg by adding additional color to help the smoothing of one color to the next. Remember here that you can select your color on the fly with the ALT key. Use the same process of applying highlights to the leg and foot, and then add in some shadow to the top of the legs where the skin meets the shorts. 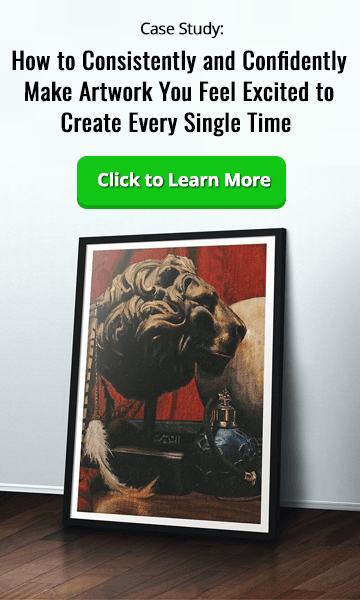 The drawing is really starting to come together now and each time that the picture in the video zooms in and out you can see just how great things are looking as an overall painting. 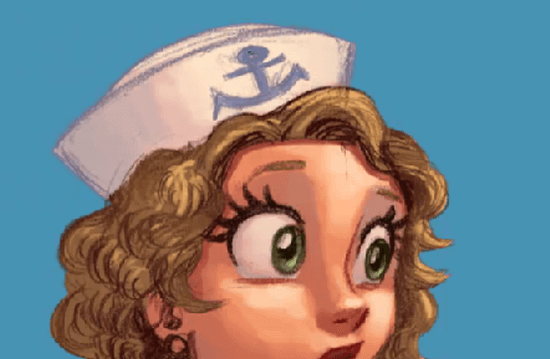 You can finish up this stage of leaning how to paint a pin up girl in Photoshop by adding some shadow and highlight into her cap and the upper lip on her face. The last areas that have received a little additional lightening are the eyes. While you’ve been adding highlights to the upper portion of the arms, hair, clothing etc, with the colored part of the eyes it’s different. Because they have a shape that actually goes inward toward the middle of the eye, the surface that is most facing the light source is on the bottom of the eye. 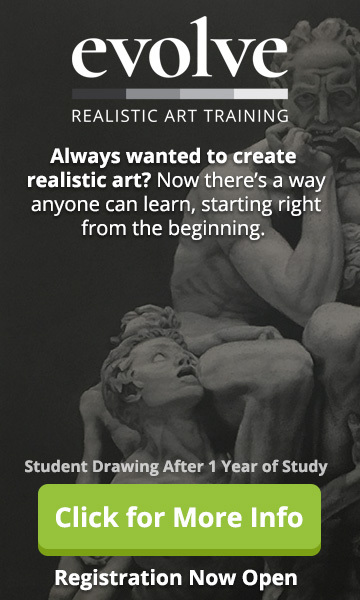 Here you can take a look at how far this drawing has come in just a few short lessons…but there’s still more to be done to make it look even better! 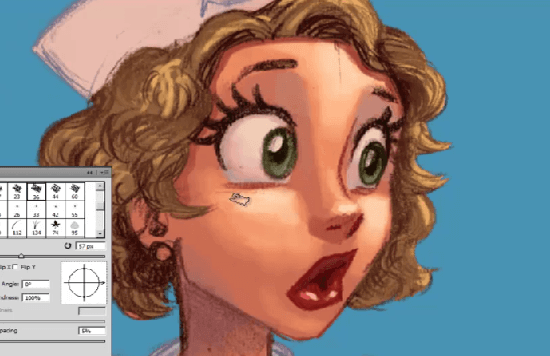 Let’s keep going with the next lesson on how to paint a pin up girl in Photoshop!